When I first made the jump from Microsoft Word 97 to Word 2007, it was just that … a giant leap. Going a decade between software updates is as dumb as it sounds, but when you’re used to a solid word processor like Word 97, you tend to stick with what you know. Word 2007 changed all that. XML file formats and a revamped interface drove me crazy for the first couple weeks (months? ), but after time (and a few patches that made ’07 files compatible with older versions of Word), I became a fan. Luckily for Word 2007 users, upgrading to 2010 won’t be such a leap. 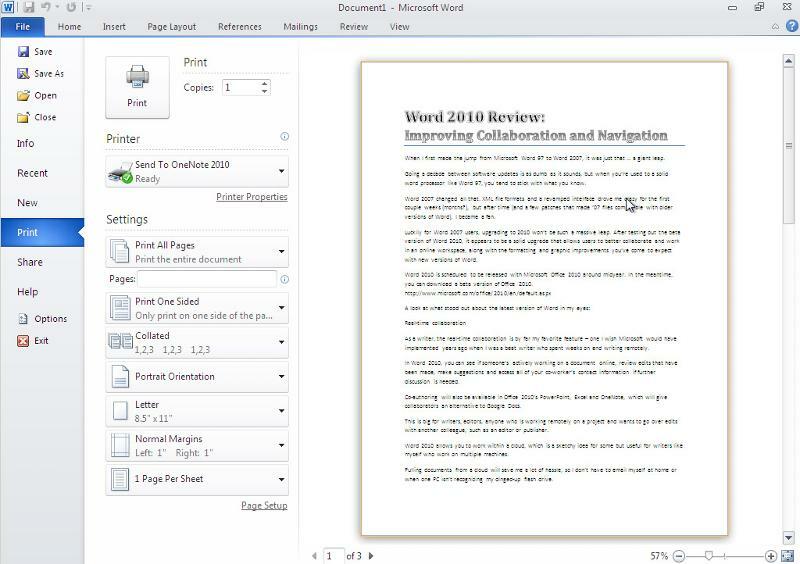 After testing out the beta version of Word 2010, it appears to be a solid upgrade that allows users to better collaborate and work in an online workspace, along with the formatting and graphic improvements you’ve come to expect with new versions of Word. Word 2010 is scheduled to be released with Microsoft Office 2010 around midyear. In the meantime, you can download a beta version of Office 2010. As a writer, the real-time collaboration will probably be my favorite feature – one I wish Microsoft would have implemented years ago when I was a roaming reporter who spent weeks on end working remotely. 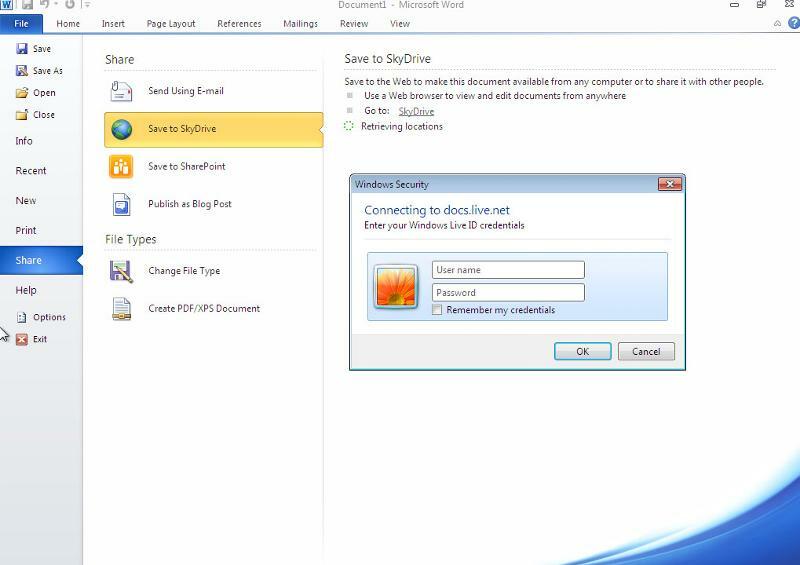 In Word 2010, you can use SkyDrive to save your document to the web and make it available from any computer or share it with colleagues. All you need is a Windows Live account and to share your document to docs.live.net, which can be done by going to File --> Share --> Save to SkyDrive. Once shared, you can see if someone’s actively working on the document online, review edits that have been made, make suggestions and access all of your co-worker’s contact information if further discussion is needed. Co-authoring will also be available in Office 2010’s PowerPoint, Excel and OneNote, which gives collaborators an alternative to Google Docs. This is big for writers, editors, anyone who is working remotely on a project and wants to go over edits with another colleague, such as an editor or publisher. Word 2010 allows you to work within the “cloud,” which is a sketchy idea for some but useful for writers like me who work on multiple machines and often collaborate with other editors or writers. Pulling documents from a cloud will save me a lot of hassle, so I don’t have to email myself at home or when one PC isn’t recognizing my dinged-up flash drive. And as long as you back up often, work smart, and keep your documents secure, working in a cloud shouldn’t be any more of an issue than working on a website hosted on somebody else’s server. Another issue with the older versions of Word was search functionality. Ctrl-F can only take you so far in this day and age. 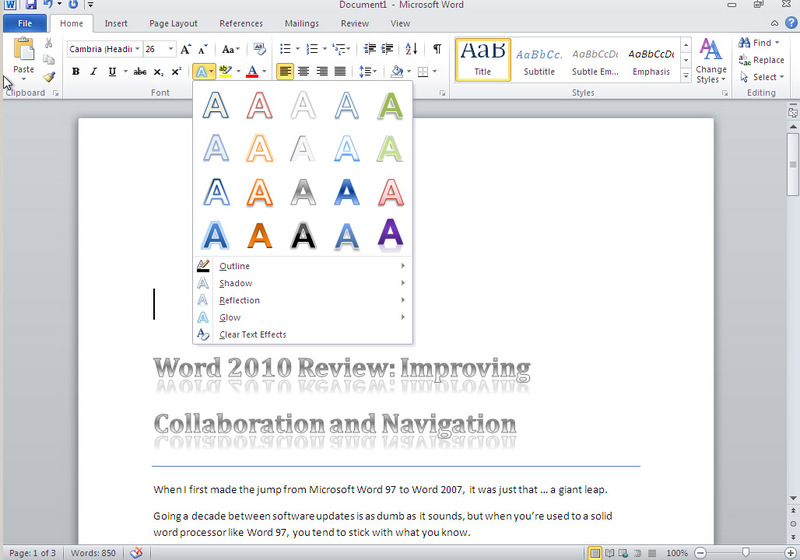 Word 2010’s navigation pane and find/search experience continues to evolve. The new nav/sidebar – which essentially combines the features of the docu map, thumbnails, outline view and find – allows users to reorganize documents by dragging and dropping rather than copying and pasting actual pages of content (which can be a pain due to Word’s auto formatting). Jumping around via the sidebar is becoming the standard, think PowerPoint and Adobe Acrobat, so it’s nice that Word is keeping up with the competition. From the sidebar/nav, you can follow what pages are actively being edited by co-authors and remain aware of edits via the co-author indicator. Incremental search makes searching more efficient, and the search-summary highlights are more helpful when working in large documents. This is useful when working within wordy whitepapers or for tech writers working in manuals they’re unfamiliar with, editing manuscripts, etc. 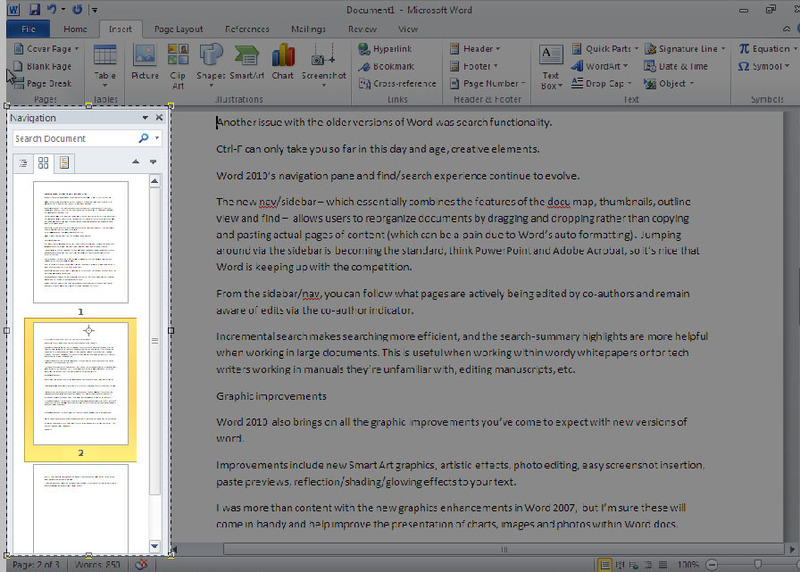 Word 2010 also brings on all the graphic improvements you’ve come to expect with new versions of word. Improvements include new Smart Art graphics, artistic effects, photo editing, easy screenshot insertion, paste previews, reflection/shading/glowing effects to your text. I was more than content with the new graphics enhancements in Word 2007, but I’m sure these will come in handy and help improve the presentation of charts, images and photos within Word docs. Screenshots, however, have been a big sticking point with the community, which is why Microsoft streamlined the process of capturing screenshots in Word 2010. You could always just hit “Print Screen” and paste/Ctrl-V it into your 2007 Word .doc, but going the Insert --> Screenshot route in Word 2010 is a more user-friendly experience. Printing improvements: Print preview/print screens have been combined and are much more user friendly. Get rid of Works: Microsoft has announced Microsoft Works will be replaced on bundled PC packages by a lightweight version of Word (a lightweight version of Excel will also be included) in Office Starter 2010. Still waiting to hear more details about what features will be included in this version of office, but I’m glad they’re moving away from Works. All in all, I think Word 2010, like most of the products in Microsoft Office 2010, will be a solid upgrade with an emphasis on online collaboration. 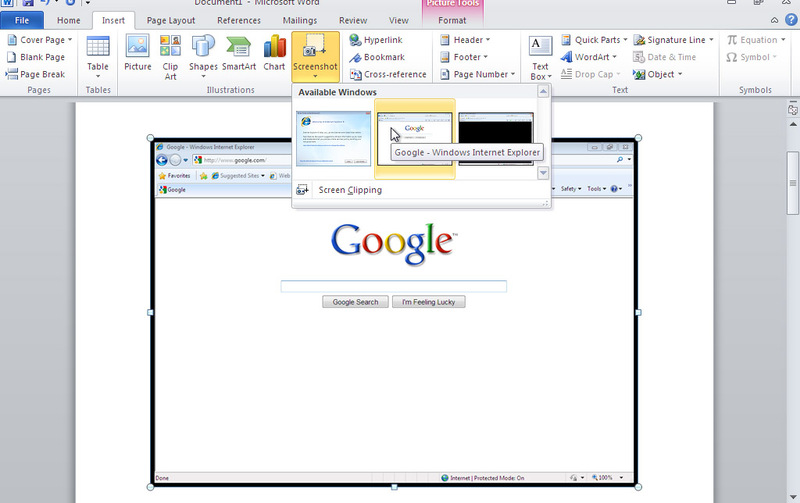 I think the biggest question for the consumer will be just what features will be available online, and how much the complete Office Professional 2010 suite will set them back. On Tuesday, Microsoft announced it will offer an Office 2010 Tech Guarantee Program by the end of the March, which will allow users who purchased Office 2007 to get a free copy of the equivalent version of Office 2010. That’s a good start. Now that beta testing is wrapping up, and the development of Office 2010 is nearing completion, we should be getting more details about pricing and release dates shortly. In the meantime, if you’re considering upgrading to Microsoft Office 2010, give the beta version a spin and see if you like what they’ll have to offer later this year.